Be May the month of fabric organisation. My half cupboard is in bad need of some reshuffling (as you can see at the top of above photo). 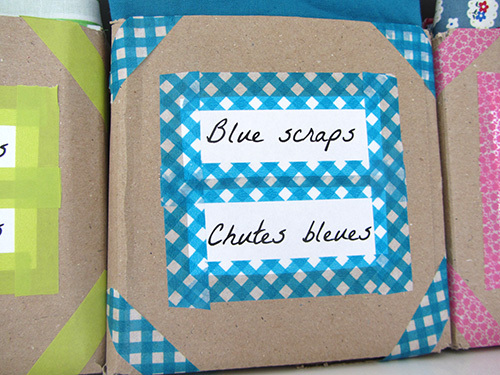 Inspired by a book I will review here later, I tackled the project with scraps organisation. I am now the proud owner of tidy little boxes to store my fabric scraps by colour, ho joy! 1 – Put all of my stash on the table and made a pile with a large pieces (more than a fat quarter), good size scraps and smallish scraps (less than 20cm / 8”). 2 – Smallish scraps were divided into neutrals decor fabric and coloured light weight cotton (this could be different for you, this is what my stash is made of). Each scrap was carefully folded before being moved to one or an other basket. 3 – Folded my good size scraps so they could fit in these card boxes of mine. I then divided in enough colours so the boxes would not be too full but would still have room for some additions to the collection. 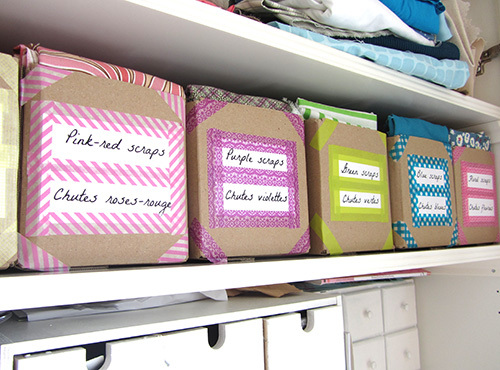 4 – I printed labels using a lovely hand written look type and stuck them with matching washi tape. The boxes are now nicely sitting on one shelf and I love this jam jar look of them. Final result: I now have 2 baskets (for the smallish ones) and 6 boxes instead of an ugly blob of fibers. This is what a good craft project is for me: fun to make with useful and pretty result. Next up: deal with the pile of larger pieces. Next Post May dress: it’s a skirt! Practical and pretty too! Perfect!